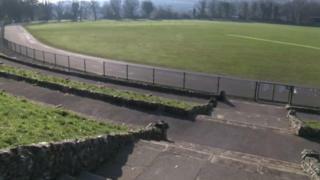 A £298,000 scheme to restore Brighton's outdoor velodrome to competitive racing standards has been approved. British Cycling stopped racing at the Preston Park track in January due to safety concerns. Brighton councillors agreed a £298,000 refurbishment scheme, made up of a British Cycling grant and £100,000 in match-funding on Thursday. Thousands of people signed a petition earlier in the year calling on the council to help save the velodrome. Users of the facility, which was dug out by hand by the British Army in 1877, also staged a number of protests including a "slow ride" round the track. Development director at British Cycling, John Mills, said: "We welcome the decision by Brighton and Hove City Council to commit funding for the refurbishment of the Preston Park facility. "This is a boost for all levels of cycling in Brighton and the wider South East region as a whole. We look forward to working with the council to prepare a successful funding application and to deliver the refurbishment project." Councillor Warren Morgan described the velodrome as a "popular and historic cycling facility". "We have approved match funding for the cycle track improvements as a one-off project and we'll also be working with the Friends of Preston Park to draw up a long-term management plan to enhance the park for all its users," he said. The velodrome was closed to competitive racing by British Cycling in January because of the condition of the perimeter fence but remained open for leisure use.